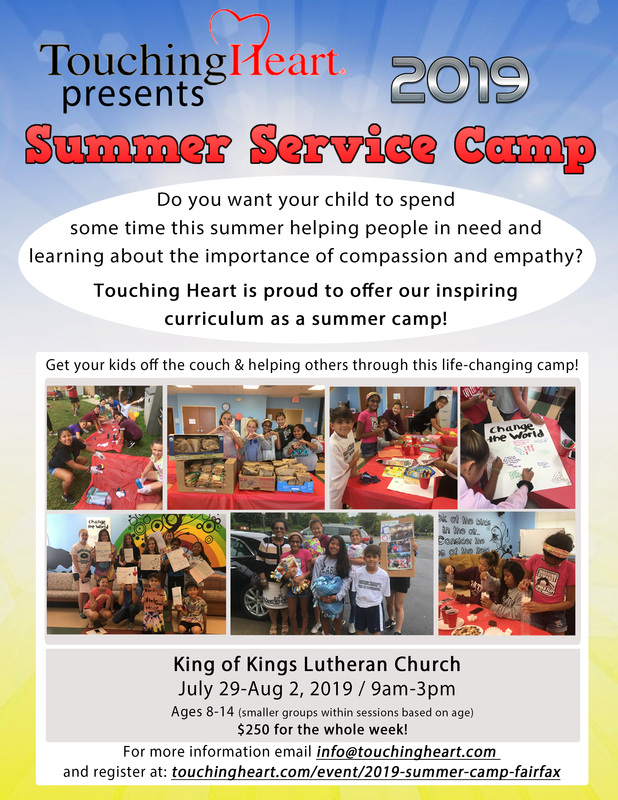 Do you want your child to spend some time this summer helping people in need and learning about the importance of compassion and empathy? Touching Heart is proud to once again offer our inspiring curriculum as a summer camp! Get your kids off the couch & helping others through this life-changing camp! This camp is for ages 8-14, from 9am-3pm the week of July 29-Aug 2, 2019 at King of Kings Lutheran Church in Fairfax, Virginia. View photos from previous summer camps 2018 here and 2017 here! Registration is now open and spots are limited, sign up today to secure your child’s spot in this fun and inspirational week of camp! Only $250 (non-refundable) for the entire week! EARLY BIRD DISCOUNT – Register by April 15th and get $50 off!!! Any known allergies or health concerns? Person(s) authorized to pick up child at end of day. I understand that by signing up for the camp, my child will be photographed for Touching Heart marketing. *NOTE* Submitting this form will register your child for this event and take you to our PayPal page for payment. **Please note that payments are non-refundable** Your child's spot is not confirmed until you receive a receipt of payment from PayPal.